Roy Conli is no stranger to producing. He started his career producing theatrical productions, then entered the world of animation. Conli has been producing animated films now (including most recently Big Hero 6), for twenty-four years. Conli discussed that immediately after finishing Walt Disney Animation Studio’s Big Hero 6, he was asked to help develop the story for Disneynature’s Born in China, which eventually led to him producing this film. Conli came on board in 2014, and was eager to work on the project after seeing previous film’s of Born in China’s director Chuan Lu. 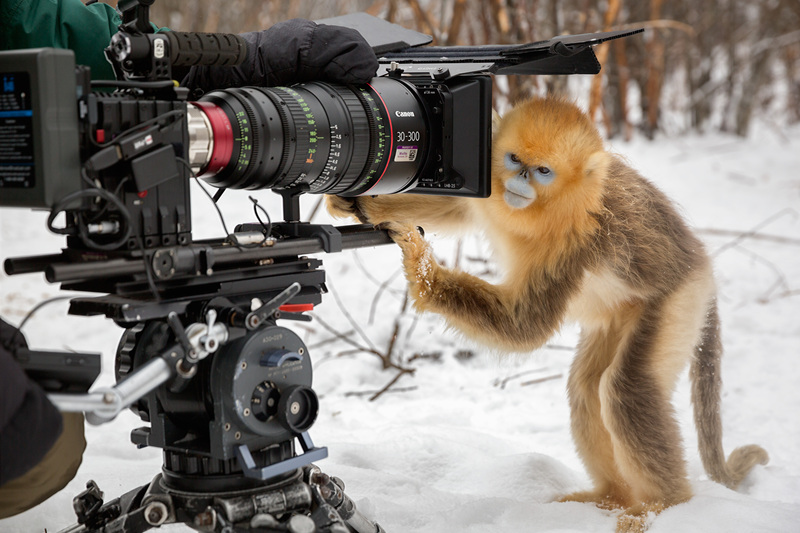 Conli got to work alongside Lu and two o the top nature photographers int he world to shoot the captivating stories of pandas, snow leopards, and golden monkeys in the wilds of China. Conli mentioned that although the storytelling of a documentary film is much different from an animated film, the story is still quite important and very strong. With a True LIfe Adventure film, you are starting with footage, and then creating a story out of what you have filmed. Even though their are storytelling narratives, the footage seen is raw, it isn’t altered, they use the raw footage of the animal families whose lives they have been documenting. Conli discussed that a major aspect in bringing Disneynature films to life is the perseverance of the filmmakers in collecting the footage of the pandas, snow leopards, and golden monkeys. He recalled that it took the cinemotography team 253 days of filming, with over four trips taken, and spending a time span of over six seasons. During some trips, the filmmakers didn’t even find the animals until they were about to leave! Description: The crew’s camp for filming chiru in the remote highlands of the Qinghai Plateau. True Life Adventures, documenting the lives and families in the wild, have long been cherished by audiences. Roy Conli himself grew up watching these films, and having grown up in the suburbs Disney’s True Life Adventure stories was his own introduction to wildlife. Although this was Conli’s first live action film, he said that he had an amazing experience, and will also be working on Disneynature’s next True Life Adventure story. Born in China is now open in theatres! If you see the film April 21-27th, a portion of ticket sales will be contributed by Disney to the World Wildlife Foundation to help benefit wild pandas and snow leopards.